Member of the French National Assembly, Thierry Mariani, has said that while being a secular state, Azerbaijan is a model country in the field of religious tolerance. He made the remarks in a conference titled "Voyage to secularism models - France-Azerbaijan: unique appearances or universal examples?" 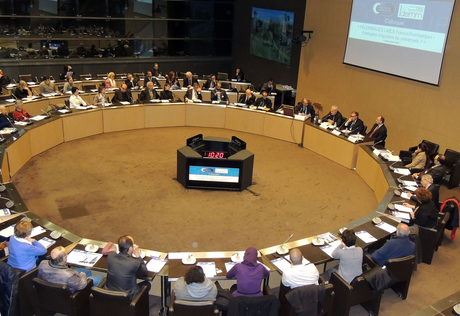 which was held at the French National Assembly in Paris, on December 16. Mariani, who is also head of France-Azerbaijan Friendship Group and MP for French residents overseas, added that "Though Azerbaijan is at war with the neighboring Armenia, various nations, cultures and religions peacefully coexist in Azerbaijan, which is predominately a Muslim country". Mariani, who chaired the conference, underlined that Azerbaijan can serve as an example in this field to other countries. The event was organized by the European Azerbaijan Society and the Institut de Découverte et d'Étude du Monde Musulman (IDEMM). The event was attended by experts in secularism, historians and professors, Azerbaijani and foreign students studying in Paris, representatives of Azerbaijani Embassy, foreign diplomats and other guests. Representative of TEAS Roman Huna, Head of National Secularism Observatory Jean-Louis Bianco, historian, sociologist and founder of secularism sociology, Professor Jean Baubérot, Head of the Bordeaux Mosque and Director of IDEMM Tareq Oubrou, member of CRIF (Representative Council of Jewish Institutions in France) Board of Directors Jean-Pierre Allali and Counselor of the Azerbaijani embassy in France Nigar Huseynova addressed the event. Discussions were held on two topics at the two-part conference: "Tasks of secularism in France and in the world" and "Example of secularism in Azerbaijan". Huseynova said bordering with various countries, Azerbaijan as a secular state has became a center of interreligious and intercultural dialogue. Various religious faiths operate in Azerbaijan. More than 95 percent of the population of Azerbaijan professes the Islamic religion. All the major religious denominations are represented in the country. Currently 574 religious communities are registered in Azerbaijan, 21 of them non-Islamic communities. "Mutual respect, solidarity across denominational borders and dialogue are the core values underpinning secularism in the country," László Surján, vice-president of the European parliament and member of the working group on freedom of religion or belief, and Willy Fautré, director of Human Rights Without Frontiers International, said recently in their article published in The Parlament.com. "The Azeri society is built on positive secularism, meaning not abandoning the denominations, neither excluding religion from public life, but practicing the perspective of the same proximity to all beliefs," the authors said.